Canada doesn't have very many space focused contests, scholarships or prizes and the only obvious exception to this is the University of Toronto space design contest, focused on educational programming in science, engineering, and space exploration for secondary students. The "website of record" for this sort of activity is called Space Prizes and it contains absolutely no listing of Canadian based prizes so it seems reasonable to conclude that our exceptional individuals have to generally travel outside Canada in order to continue learning and being recognized as exceptional. That's why it's so inspiring to hear about people like Laura Drudi, a McGill University student in the Faculty of Medicine, who has just received word of acceptance at the prestigious NASA Academy at the Ames Research Center. "The NASA Academy represents an immersive and integrated multidisciplinary exposure and training, for students with various backgrounds and career aspirations of critical importance to the National aerospace program. The academic curriculum balances opportunities for direct contact with advanced science and engineering R&D and an awareness of the complex managerial, political, financial, social, and human issues faced by the current and future aerospace program. Co-sponsorship of the Academy assures recruitment of meritorious students from previously under-represented areas of the country, into leadership positions for the aerospace programs of the future. The Academy is cost effective, providing a richer program at a cost comparable to other, narrow-focus scholarships, internships, and fellowships." But according to Drudi, the NASA Academy is the opportunity of a lifetime. "This is the third time I've applied and Canada wasn't sponsoring anyone last year" she said during a phone interview from her home in Montreal. "You can't give up on something like this or you'll never get it. I've never given up and I just wanted to tell everyone else never to give up on their dreams." She credits her success to strong mentoring from professors and supervisors including Dr. Joan Saary at the University of Toronto (who is her supervisor on the Space Medicine Directory, a cross-referenced listing of space medicine and space life sciences training opportunities) and Dr. Marlene Grenon, at the University of California San Francisco Department of Vascular Surgery (who supervised her during a literature review on the effects of altered endothelial cell function, mechanisms and interactions at the cellular level). Drudi is a member not only of the Canadian Medical Association, but also of the Aerospace Medical Association and the Aerospace Medical Student and Resident Organization. She hopes to one day bring health care to astronauts high above the sky. "Canadian astronaut Robert Thirsk dealt with lots of major physical changes during his stay on the International Space Station including bone demineralization, cardiovascular changes and quite a few other things" states Drudi, who felt that the only real prevention was lots of exercise, including lengthy sessions on the Combined Operational Load Bearing External Resistance Treadmill, or COLBERT, named after comedian Stephen Colbert. "I'm drawn to this whole new extreme environment where you need to apply all that you know in new and innovative ways" states Drudi. "Nothing is really out of bounds and everything is useful. It's an exciting challenge." Last October, Drudi attended the 60th International Astronautical Congress (IAC) in Daejon, Korea where she participated (along with Canadian Space Society President Kevin Shortt) in a session titled "Entering the Workforce and Strengthening the Global Community" which talked about how young professionals in space-related fields contribute to the global space community. According to the IAC website, "It is widely accepted that attracting young people into the aerospace workforce is vital to the industrial base of nations involved in space-related endeavors." This message seems widely accepted outside Canada so it will be interesting to see if it ever becomes the general consensus within. The Report From "Our Growing Canadian Commercial Space Sector"
Ask Arny Sokoloff, the President of the Canadian Space Commerce Association (CSCA) and he'll likely tell you in no uncertain terms that the CSCA is well positioned "at the intersection of space and business" with resources focused on legal, regulatory, financial and entrepreneurial issues of special concern to Canadian space focused firms. This expertise was on display at the MaRS Development District in Toronto, Ontario at the 2010 CSCA conference and annual general meeting which wrapped up Tuesday, March 16th with presentations on a variety of topics including the need to embrace fixed pricing when bidding for Canadian, American or international contracts, making use of terrestrial markets as engines for ongoing growth, the uses and restrictions of intellectual property (IP) legislation when protecting stakeholders in space focused development projects and an overview of both the Canadian industrial and regional benefit (IRB) policy and scientific research experimental development (SH&ED) tax credits. There was even some interesting back and forth discussion on how Canadian companies can benefit if the US fails to revoke the Strom Thurmond Defense Act. Suggestions were also made about creating a government-sponsored engineering firm with a mission to train young engineers and undertake public works projects. Attendees and speakers included representatives from large firms like MacDonald Dettwiler and Associates (MDA), BMO Nesbitt Burns, law firm Blake, Cassels and Graydon LLP, smaller space focused companies such as Continuum Aerospace and Engineering Services Inc. (ESI), firms moving into space focused activities from other areas like Javelin Technologies and firms providing support services like SH&ED focused law firm StoneCracker Scientific and IRB experts WāVv Business Development. Traditional media interest was also noted and I was interviewed on the conference for the final segment of the March 16th edition of the CBC Toronto radio program Here and Now. 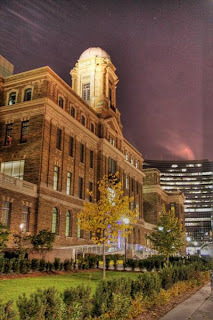 As well, author David Pugliese in his March 22nd Ottawa Citizen article "$27M space program light on domestic benefits: critics" focused on inconsistencies in the application of the IRB credits in the Canadian Forces (CF) administered Joint Space Support Project. ...one of the problems with government programs like IRB is that federal politicians and government bureaucrats have little knowledge of the actual capabilities of the country's space industry. Suggestions were also made to arrange for future presentations by experts on Industry Canada (IC), the Strategic Aerospace & Defence Initiative (SADI), the National Research Council (NRC) Industrial Research Assistance Program (IRAP) plus the Canadian Space Agency (CSA) Space Technology Development Program (STDP) and Earth Observation Applications Development Program (EOADP). For those interested in learning more about the presentations, the next CSCA meeting is scheduled for Thursday, May 13th at 7:00 pm. "Canada's largest satellite company is mulling global acquisitions after the federal government said it would loosen foreign ownership restrictions in the telecom sector." The article goes on to state that the federal government has indicated that this is being done as a preliminary to doing the same for the broader telecommunications industry. Canada's largest satellite company is, of course, Telesat which originated as a Canadian Crown corporation mandated to develop communications services in the far north, according to the document "The Creation of Telesat: Canadian Communications Policy, Bell Canada and the Creation of Myth" by Howard Fremeth. With headquarters in Ottawa, the firm still maintains deep Canadian cultural, commercial and technical roots, although the cultural component might not be immediately apparent from a casual perusal of the Telesat corporate history page, which indicates that "Telesat is a newly formed company, but our industry leadership actually spans more than 40 years through the commercial and technical achievements of Loral Skynet and Telesat Canada." 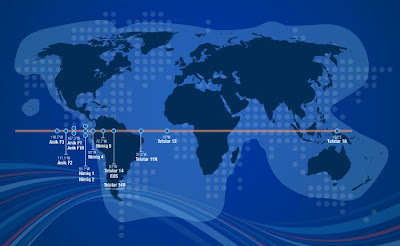 But the cultural component is still there, at least according to activist and author Fred Wilson in his article "The fight is on for Canadian communications and culture:"
"Telesat was the single greatest Canadian telecom accomplishment since Alexander Graham Bell. When Anik I went up in 1972 we were the first country in the world to use satellites for domestic communications. Its first customer was the CBC, which used the satellite to broadcast to Canada's north." While Telesat publicly promotes the possibility of new acquisitions to grow the company, Wilson quite reasonably points out that the proposed rule changes also make it easier for other companies to buy Telesat. He states that, while the majority of Telesat shares are still owned by the Public Pension Investment Board of Canada, "this is something that Telesat executives hope to change real soon." A close look at issues surrounding a potential Telesat sale will likely turn up quite a bit of overlap with an actual failed 2008 bit for Macdonald Dettwiler and Associates (MDA) from US based ATK so it will be interesting to see how things play out should a buyer for Telesat ever come forward. Space Firms "Big Success" but CSA Plan "MIA!" If Borat were Canadian, he'd certainly be impressed with MacDonald, Dettwiler and Associates Ltd. (MDA) and COM DEV International who each had a pretty good week announcing formal approval and funding for new space focused projects. It's a shame these Canadian successes weren't matched by the Canadian Space Agency (CSA) which publicly admitted for the first time on Monday that their long awaited and long-term space plan (LTSP) hasn't yet been even presented to the Canadian government. "COM DEV will supply switches, filters and multiplexers for use on the satellites which EADS Astrium is building for SES S.A. The satellites will deliver next generation broadcast, VSAT and broadband services in Europe and Africa." The initial contract is expected to lead to further contracts valued in excess of CDV$14 million, with work scheduled to be completed by early 2012 at the COM DEV facility in Cambridge, Ontario. MDA's success, expected since the federal government unveiled their budget two weeks ago, officially occurred a day or so later with the formal announcement of Canadian Space Agency (CSA) authorization for MDA to begin the design phase of the RADARSAT Constellation mission. This contract is valued to $11.8 million and is expected to be completed by June 11, 2010 according to the SpaceRef.ca article "MDA Gets Next Contract in RADARSAT Constellation Mission." There is however, no word on whether these successes are related to the missing CSA long-term space plan (LTSP) which, according to the article "Canadian Space Policy Idles or Does it?" on the SpaceRef.ca website has not yet even been submitted to cabinet for consideration. "In the near future, the Agency will be fine tuning the input received from stakeholders and presenting the Plan to the Minister of Industry and Cabinet for consideration." So after working on the LTSP for almost two years as part of a request by then Industry Minister Jim Prentice in late summer of 2008 and being told that "time is of the essence," the document still has not been submitted by CSA president Steve MacLean to cabinet as of March 2010. The Canadian LTSP is essentially missing in action by the admission of the CSA Director of Communication and Public Affairs but at least he attached his name to the admission so now we know who should be fired first. On the plus side, this development might not be totally unexpected. For example, there are small but growing indications that COM DEV, MDA and others are beginning to set their own course, irrespective of the CSA and it's LTSP (although MDA has obvious support from the Canadian government for the Radarsat Constellation project on the basis of arctic sovereignty). "...we have private citizens, individual organizations and Canadian corporations each acting independently and without the CSA to build their own unique international relationships and space focused opportunities. It's gone so far that our future in space may no longer be tied to our national space agency, as of this week in space for Canada." 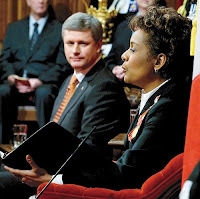 I then followed my comments up with a February 15th, 2010 post on this blog under the title "Ottawa Citizen: "Where did that Long Term Space Plan Go?" by commenting that "if Canada does not define a long term space plan, private business and academia will soon go about creating their own." Welcome to our Canadian future in space. Does anyone see the CSA anywhere? American politicians like Bob Bennett, Orrin Hatch and Rob Bishop (all three who are teaming up to save the Constellation and Ares programs according the space news site Galaxy Wire) and military commentators like the US Air Force Times ( which warns that "The Air Force and National Reconnaissance Office could face major increases in the cost of launching satellites") are obviously concerned over the emerging commercial space landscape. Commercial rocket company SpaceX successfully completed the latest test firing of the Falcon 9 launch vehicle on March 13th according to this article on the Commercial Space Watch website. The company's goal is commercial crew transport to the International Space Station (ISS). David Lenard, a technology and science correspondent for MS-NBC writes about how "Suborbital Spaceships Spark Scientific Frenzy." He states that "Anticipation is on the rise for a new crop of commercial suborbital spaceships that can serve the scientific and educational market" Funding for these craft (expected to compete with Virgin Galactic Space Ship II) is expected to come from the $75 million allocated to the NASA Commercial Reusable Suborbital Research (CRuSR) program in the FY2011 budget. Radio Sweden International, under the title "Four Swedes Waiting to Travel to Space" discussed Ann Klefbom from Umeå who has reserved her ticket on Space Ship II and hopes to become the first Swedish woman in space. According to the article, she still needs to raise approximately $200,000USD to pay for her ticket. According to the article "Space Agency Heads Discuss Extending Space Station Lifespan to 2028" on the SpaceRef.ca website "the leaders of the space agencies from Canada, Europe, Japan, Russia and the United States" are meeting to discuss extending the life of the International Space Station (ISS) until 2028. This seems to indicate that the US is no longer the primary driver behind the ISS, especially given that the March 11th press release promoting the event specifically stated that "the ISS will also allow the partnership to experiment with more integrated international operations and research, paving the way for enhanced collaboration on future international missions." In Canada, even the Aerospace Industries Association of Canada (AIAC) is acting supportive of private space industry by revising their March 4th, 2010 press release (which praised additional funding for the Canadian Space Agency to complete the Radarsat Constellation mission) with this March 11th press release titled "The Canadian Aerospace Industry praises the federal government for recognizing Space as a strategic capability for Canada." The latest press release says pretty much the same thing as the earlier one but drops statements included in the March 4th document on defense cuts impacting "the procurement and sustainment of aircraft" and AIAC disappointment "that no mention of Canada’s aerospace industry – a clear leader in innovation – was made in the federal budget." It's likely that the second statement was dropped because the "space" part of aerospace was indeed mentioned in the federal government documents, even though the "aero" part wasn't. Lastly, the Canadian Space Commerce Association Annual conference and general meeting is Tuesday, March 16th at the MaRS Development District. The theme of the conference is "The Growing Canadian Commercial Space Sector" which likely isn't directly related to aircraft either although we promise to mention them, once or twice. Newspapers "Not Good Enough for this Blog!" Traditional mass media has difficulty covering complex science and technology stories, at least according to organizations like the Science Media Centre of Canada and this is part of the reason why daily newspapers like the National Post, Le Journal de Montréal and the Vancouver Sun are seldom used as primary source materials when putting together this blog. My normal writing pattern is to begin based on primary documentation provided through personal connections, news feeds, press releases, blogosphere comments or url links passed along from readers. I then follow-up with requests for clarification from the primary source and attempt to second source the material utilizing some fancy data-mining techniques learned from my marketing acquaintances. I also create multiple search engine queries to assist with independently validating the core material. Only then do I create the article for posting. Where once this would have taken quite a bit of time, effort, snail mail and phone calls, the net has built a universe where this can be done quickly and efficiently by anyone with a computer, the correct methodology and a modicum of common sense in a way that simply can't be reproduced by what used to be called "the mass media." 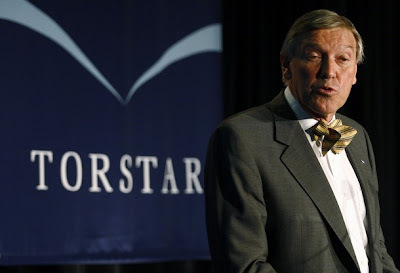 "I think we did make a big mistake," said John Honderich, who serves as chairman of the board and of the voting trust for Torstar Corporation, which owns The Toronto Star. "The whole model doesn't work. Everyone is saying now that we have to back up and absolutely rethink where we're going on this whole debate." 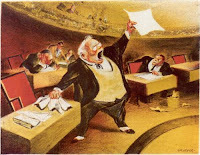 According to the article, Hondrich states flatly that no newspaper appears to have been able to profit from offering content free online and believes the industry will move toward readers paying for content, an idea attempted previously by the New York Times, the Globe and Mail and several others but eventually abandoned. ... most newspaper sites continue to charge for archives and other premium content in an attempt to diversify their revenue streams online. People want everything for free online, but in some cases, they will pay for very specialized information that they can't get anywhere else. When Rupert Murdoch took over the Wall Street Journal, he had hoped to bring down the pay wall, only to realize just how profitable it was. Some pay walls will work. Here we have the core problem with Mr. Hondrich's thesis that newspapers (especially his) should charge for their content. Since people will only pay for very specialized content they can't get anywhere else and there is very little specialized content in a mass market, generalized focus publication (except for the archives), Mr. Hondrich will find very few people willing to pay money for the content from his specific mass market, generalized focus publication. For example, this blog is focused on specialized content of interest to commercial space entrepreneurs and relies heavily on primary source material not normally available in print publications. The lack of useful content plus the lack of references to primary source material is why daily newspaper content (like the Toronto Star's) is generally "not good enough for this blog." So Mr. Hondrich, while it's certainly possible that newspapers blew it when they failed to react appropriately to the rise of the internet, in order to survive now they need to provide better news, easy access to primary source materials and specialized content that people can't get anywhere else. You've got quite the challenge on your hands, sir. I wish you luck. Why are so many newspace focused companies (for example, Odyssey Moon, founded by Canadian Bob Richards or PlanetSpace Corporation, which started out as the Canadian Arrow team competing for the Ansari X-Prize) possessors of such strong Canadian pedigrees but not officially Canadian based? To shed further light on Kerri Golden’s excellent recent post, the stumbling block that has been removed in this case is the Section 116 – a series of tax requirements that imposed onerous restrictions on foreign investors in Canadian firms. Of course, this post will not devolve into an argument that tax credits are the only key to building a knowledge economy. I've argued the exact opposite position as recently as my post Building a Competitive Business Environment Calls for More than Just Tax Credits. Under Section 116, a US venture capital company that wished to exit from an investment in a Canadian firm had to gather as many as 900 signatures from its limited partners, have each of them file income tax returns in Canada (even though no tax was due in Canada) and undergo a holding period that could have greatly undercut returns from a successful IPO. Little wonder that the best funded and best managed VC firms on Earth decided that Canada was a no-go zone. Incidentally, there is no such red tape for Canadian investors regarding US companies. As part of their budget outline, the Conservative government has indicated the intention to remove the section 116 "tax barrier" by changing the definition of “taxable Canadian property” to exclude shares of Canadian private companies where not more than 50% of their value is derived from real property in Canada, Canadian resource property or timber resource property. Essentially, this means that Canadian knowledge focused companies and start-ups can now solicit investors outside of Canada and no longer need to move to the US to utilize American or other foreign venture funds, just so long as the business is not too heavily focused on resources or property. German Field Marshall Helmuth Carl Bernard von Moltke is supposed to have once said that "No battle plan ever survives contact with the enemy" and I supposed the same is true about budgets and budget promises made under a minority government. However, it is good to see the Canadian government finally beginning to address some of the tax and structural issues preventing Canadian knowledge industries such as the commercial space sector from growing into world class organizations providing Canadian jobs. Now if only they'd listen to some of the ideas floating around regarding super flow-through tax credits being used to fund space commercialization activities. The consensus of space entrepreneurs, activists, and researchers is positive (more or less) when it comes to our Canadian throne speech last Wednesday and the follow-on Thursday conservative budget. Although the budget makes no mention of the long awaited Long-Term Space Plan, the additional funding provided to the Canadian Space Agency to complete the Radarsat Constellation Mission is good news for the space industry. The governments Economic Action Plan provided the Canadian Space Agency with $110 million over three years in last years budget. Of that, it was reported that $10 million had been committed while another $36 million will be committed this year. The $36 million for this year is lower than the original $60 million allocated last year. While the committed stimulus money is lower this year than expected it appears other parts of the CSA budget were left intact. This does not come as surprise. At the end of this month the government will release the 2010-2011 Report on Plans and Priorities for the CSA which will include the revised estimates for budgets in 2011-2012 and 2012-2013. This last comment would seem to suggest that perhaps there will be something close to a long-term space plan reasonably soon only we'll end up calling it a "report on plans and priorities." 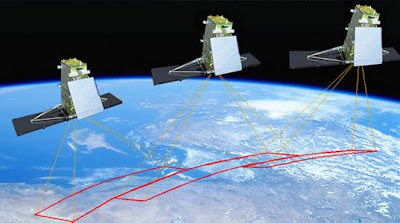 There’s nearly $400 million over five years to develop new RADARSAT remote sensing satellites. That’s like buying a new laptop: it replaces off-the-shelf technology from a few years ago with new off-the-shelf technology that has benefited, automatically, like falling off a log, from Moore’s Law in the interim. Let other countries support the cutting edge of science; Flaherty will put his bets on the dull edge of technology. According to the budget breakdown as provided in the article "more than $1.1-billion in new research-related spending" is expected to be allocated over the next five years. In essence, "the research community is receiving more than 20% of new spending measures in this budget" and some of this money will end up funding space focused research. So maybe the news is good. Some people over on the commerce and commercial side of the table might even go so far as to call the news great. 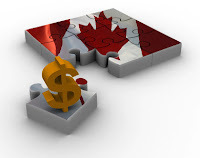 ...on March 4th, Canada's Budget 2010 announced that non-residents will no longer need to pay withholding tax on the sale of shares in a Canadian corporation. This change to Section 116 of the Income Tax Act is particularly beneficial to the high tech sector which has lobbied for years to obtain relief. The CVCA Applauds Budget Decision to Remove Foreign Investment Barrier (CVCA release Link). The CVCA has long requested the elimination of Section 116 as it pertains to the venture capital and private equity industry and we wish to congratulate the federal government for taking action," said Gregory Smith, President of the CVCA. "Many CVCA members, as well as a large number of individuals and organizations, have been actively encouraging the federal government to eliminate this section of the Income Tax Act which has had a dampening effect on cross-border venture capital and private equity transactions. Its removal provides an important signal to foreign investors that Canada welcomes their contributions to growing companies and employment." Despite the high level of federal support, we continue to lag behind other advanced economies with respect to overall innovation performance, private sector investment in R&D, and the commercialization of research. To ensure that federal funding is yielding maximum benefits for Canadians, the Government, in close consultation with business leaders from all sectors and our provincial partners, will conduct a comprehensive review of all federal support for R&D to improve its contribution to innovation and to economic opportunities for business. This review will inform future decisions regarding federal support for R&D. The Government is currently developing the terms of reference for the review. It will be interesting to see the final form that this review of innovation performance takes. It sounds like something the Canadian Space Commerce Association should be discussing next week at their Toronto conference. That there are no new things under the sun has got to have been a platitude at least as far back as biblical times when a variation of the phrase was incorporated into Ecclesiastes 1:9, but it's often surprising how accurate the phrase remains even today. For example, those of us watching the growth of a variety of private suborbital spaceports (such as the Mojave Air and Space Port, Spaceport America, Spaceport Sweden and others) might be forgiven for forgetting that private spaceports have been around for quite a long time. One of the earliest was Spaceport Canada operated by Akjuit Aerospace just outside of Churchill, Manitoba in the middle 1990's. Akjuit was initially backed by the well heeled Richardson Family of Manitoba (named after their patriarch, James Armstrong Richardson) but also included partnerships with Raytheon, investment firm Smith Barney who acted as underwriters for the project and STC Complex, a Russian organization contracted to provide surplus Soviet-era SS-25 ICBMs re-purposed as small polar orbiting launchers called START-1's (so named as they were made surplus by the 1991 Strategic Arms Reductions Treaty). 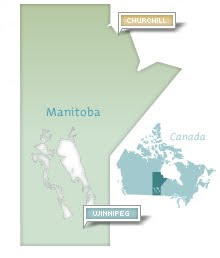 Located on the old Fort Churchill rocket launching site (initially built in the mid-1950s for sub-orbital sounding rocket launches) the plans called for a $300 million dollar investment which never materialized and Akjuit shut down in 1998. I wonder if our present day spaceport developers have the business sense and enough money to avoid the fate of Spaceport Canada and Akjuit Aerospace? Only time will tell if our space future is really "All About the Benjamins." Uploaded by jekyllah. - Music videos, artist interviews, concerts and more.